Poverty, despair and a warped sense of entitlement. Murder, guilt and self-indictment. Faith and the possibility of redemption. Suffering as God’s expression of love. In his monumental work, “Crime and Punishment,” the Russian novelist Fyodor Dostoyevsky probed every one of these themes with an obsessive, unrelenting intensity. And the haunting dramatization of the novel now receiving a Shattered Globe Theatre production - thanks to a superbly limbed adaptation by British playwright Chris Hannan and incisive direction by Louis Contey - attacks the work with the same fire and attention to moral argument as the master writer himself. An impressive achievement on every count. It all begins with a hallucinatory funeral as a corpse is carried in on a stretcher and a Russian Orthodox priest leads a funeral cortège chanting a prayer. The body is that of Raskolnikov (Drew Schad), the impoverished student who has dropped out of law school and lives in a tiny attic apartment in St. Petersburg where he survives on money from his mother’s meager pension and from the measly loans he manages to squeeze out of the elderly pawnbroker, Alyona Ivanovna (Daria Harper). As it happens, Raskolnikov has imagined his own death and rebirth. We will soon learn what drove him to this point, and how he initially rationalized his brutal acts of murder. To begin with, Raskolnikov believed he was a superior being – that his intellect and potential to add something to society entitled him to live a very different existence than the hand-to-mouth one he seemed trapped in. This allowed him to rationalize the murder of the pawnbroker, the theft of her merchandise and then a second murder of her good-hearted half-sister, Lizaveta (Jazzma Pryor), who simply knew too much. But Raskolnikov, for all his resentment, arrogance and narcissism is not without a conscience. He is distraught when he learns that his beloved sister, Dunya (Christina Gorman), plans to marry a wealthy older man simply because she knows it will bring some security to her family. And he is shaken by his encounter with the alcoholic Semyon Zakharovich Marmeladov (Darren Jones), a man whose drinking has left his wife (Rebecca Jordan) in penury, and his beautiful, deeply devout young daughter, Sonya (Ilse Zacharias), desperate enough to turn to prostitution. With his murder spree over, Raskolnikov realizes he has fumbled in his attempt to steal enough from the pawnbroker’s stash to make a difference in his life, and he begins to unravel, gradually indicting himself in the presence of the canny police investigator, Porfiry Petrovich (Patrick Thornton), a man of the shrewdest psychological insights. Raskolnikov’s greatest confession, however, is the one he finally makes to Sonya, a woman whose spiritual beauty matches her physical beauty, and whose suffering and love for Raskolnikov becomes the source of his redemption. Under Contey’s expert direction, the story unspools in a way that suggests it is all part of Raskolnikov’s fever dream, alternately starkly realistic and phantasmagoric. And this is underscored by Nick Mozak’s spare but powerfully evocative set whose floor is painted with the luminous, wide-eyed faces of women, and whose free-standing doors are used to powerful effect as the entryway to the character’s inner life. Shelley Strasser’s shadowy lighting and Christopher Kriz’s evocative music and sound design further enhance the effect, while Hailey Rakowiecki’s costumes are aptly funereal with the singular exception of Sonya’s ravishing red “woman of the evening” gown that Zacharias endows with an almost girlish innocence. The ensemble playing here is first rate, but so are the individual performances. Schad’s vivid portrayal of Raskolnikov is ideally measured as he moves from mental fracture, to panic, to anguished remorse, to self-incrimination to spiritual rebirth. And Zacharias brings an uncanny honesty and modesty to Sonya that avoids any cliché of saintliness, yet suggests an understanding of the human condition that is at the very heart of Dostoyevsky’s story. Jones is perfectly debauched and self-loathing as Marmeladov, the dissolute husband and father. Jordan is all bitterness and anger as his wife. Wiens is wholly engaging and real as Razumikhin, the truest of friends. Thornton is perfectly wily and teasing as the investigator. And there is solid work by Harper, Pryor, Gorman, Brad Woodard and Christopher Acevedo. This Shattered Globe production arrives on the heels of other recent outstanding productions by the company including “How to Use a Knife” and “The Heavens are Hung in Black.” And while it has produced more than 60 shows over its 28-year history, and attracted a loyal audience, it is not nearly as widely recognized as it should be. Perhaps “Crime and Punishment” will turn the tide. 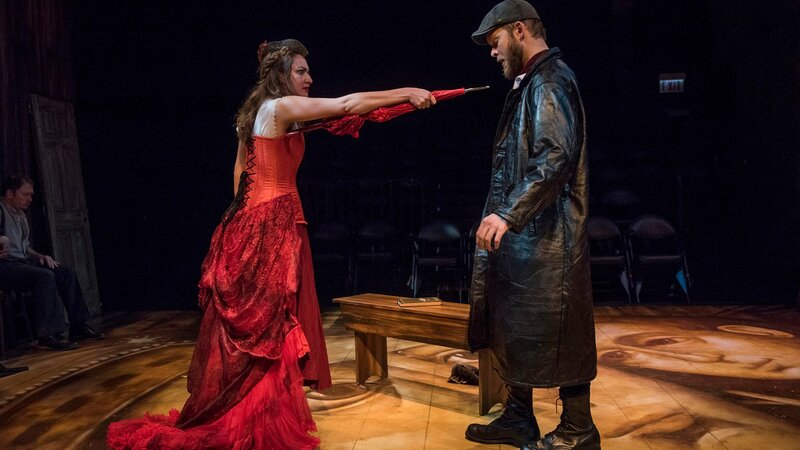 The Shattered Globe Theatre production of “Crime and Punishment” runs through Oct. 20 at Theater Wit, 1229 W. Belmont Ave. For tickets ($39) call (773) 975-8150 or visit www.shatteredglobe.org. Running time is 2 hours and 35 minutes.